January 22nd is Nurse Legislative Day. It is an opportunity for you to invest a small amount of time that will result in benefits for every one of your constituents. Nurse Legislative Day is being coordinated by the Washington State Nurses Association, which has arranged for a meeting with you on that day. Governor Inslee will be the keynote speaker at a morning meeting, after which UW School of Nursing faculty and students will join nurses and nursing students from throughout Washington in meeting with legislators. We want to provide background information about urgent nursing priorities including simulation education, doctoral nursing education, funding for public and population health, and access to mental health care. Attached is a brief summary of these issues. About 90 UW School of Nursing students are participating. The future of healthcare in this state rests heavily on nursing education. 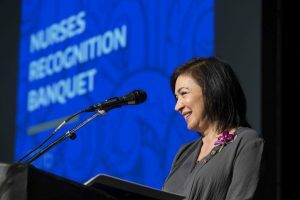 As the largest educator of nurses in the state, UW plays a key role in educating the nurses who can make a significant healthcare difference throughout the state. Your support of nursing education is an important contribution to the health of your constituents. Meeting with you is an exciting opportunity for our students to put into practice what they have learned in the classroom about advocacy, policy making and the translation of policy to practice. We hope you will share with them some insights about the legislative, budget, and related processes that determine what can — and can’t — be done. Healthcare is an issue for every one of your constituents. Whether rural or urban, rich or poor, access to adequate healthcare is important to every person. We look forward to meeting with you on January 22nd.